It's been no surprise to any user of Android devices that they have really been 'the way to go' as they have started to blanket the market. But a war was also being fought on the tablet. Long since have we been really looking to use our laptops or netbooks 'on the go'... more often we reach for these larger mobile devices. And first to market was the iPad. With the ubiquitous Apple ecosystem, they quickly became the number one tablet out there. Many Android devices came out soon thereafter, and slowly chunked away at Apple's marketshare. It was hard at first. Not a lot of the Android tablets were of the same build quality of the iPad. Frequently you'd see some techies have an Android phone, but an iPad as well. I think the corner was turned when the 7" models came around. That form factor really took off in popularity. And when devices like the Nexus 7 came out, it was really hard to argue the value at such a great price point. Even Apple tried to copy it with the iPad mini. In 2012 iOS was still beating Android by almost 20% (they had 61 million and Android 53). 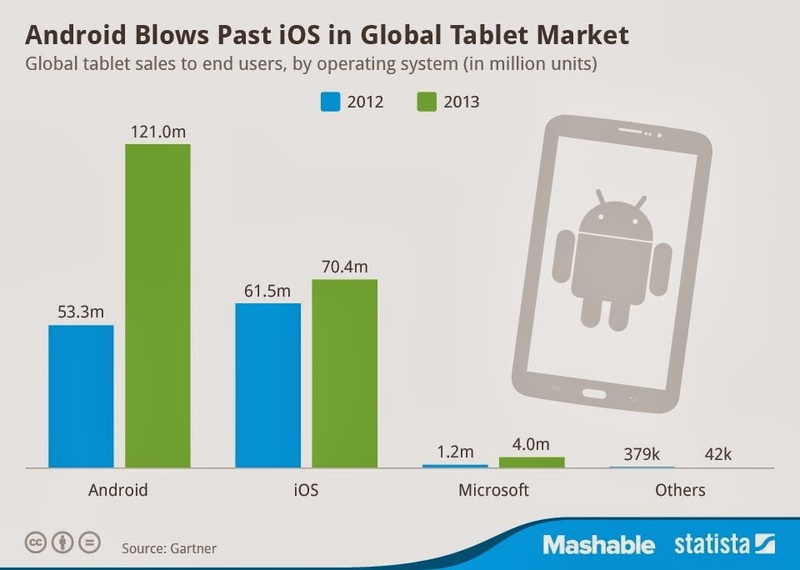 But, by the end of 2013 Android is almost 2x the iOS sales (121 million vs. 70). Personally, I believe this success is due to Android's versatility. As much as Apple "just works", the "one size fits all" approach just doesn't really work when you go to a larger and larger market. Android allows itself to be whatever the customer wants. And the people are agreeing.